In modern wireless communication systems, complex modulation techniques are employed for increased data rates and spectral efficiency. However, conventional radio frequency (RF) transmitters with linear power amplifier operation only provide moderate overall transmitter efficiency for complex modulated signals. Switched-mode power amplifiers (SMPA) with appropriate baseband modulation techniques such as pulse-width modulation (PWM) are employed to increase the overall transmitter efficiency. One of the drawbacks of this technique is out-of-band power. This out-of-band power needs to be filtered in order to fulfill the transmission spectrum requirements, thus reducing the overall efficiency. A measure for the efficiency degradation of such pulsed transmitters is the coding efficiency. This work investigated optimization concept on the coding efficiency for multilevel pulsed transmitters. 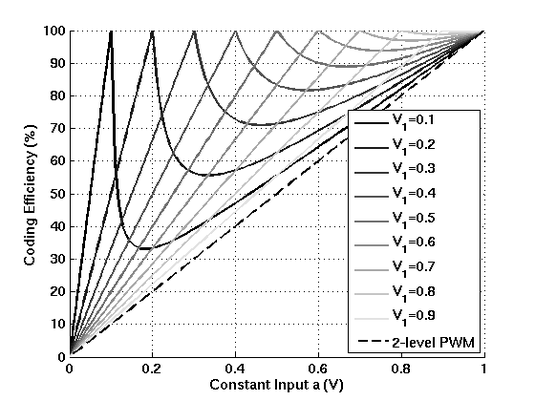 The figure above illustrates the comparison of coding efficiency curves between the optimized multilevel and the two-level pulsed transmitters for constant input signals. As shown, all solid curves (optimized) are better than the dashed curve (two-level), meaning that the optimized multilevel pulsed transmitters outperform conventional two-level transmitter in terms of the coding efficiency. For complex modulated signals, efficiency improvement can be further increased by an appropriate chosen threshold value according to the signal statistics. Read more in our paper at MWSCAS 2011!